How to interface USB to custom Arduino Uno Schematic and programming atmega? I'm fairly new to designing schematics and working with the atmega on its own and I'm designing an arduino schematic on eagle. Ive gotten to the stage where I need to incorporate a TTL USB interface in order to program the chip. I've just became aware that the arduino uses another avr chip to do so but it appears similar to the microcontroller and just need some clarification. Since I want it all on one board like the arduino uno, my question is how is the USB-B connected to the microcontroller and how would I Incorporate it into my schematic? Another question (out of curiosity) if I was to mass produce said PCB with one program on the atmega chip and leave out a USB module so people wouldnt be able to reprogram it (without taking the board apart obviously) How would that be done? 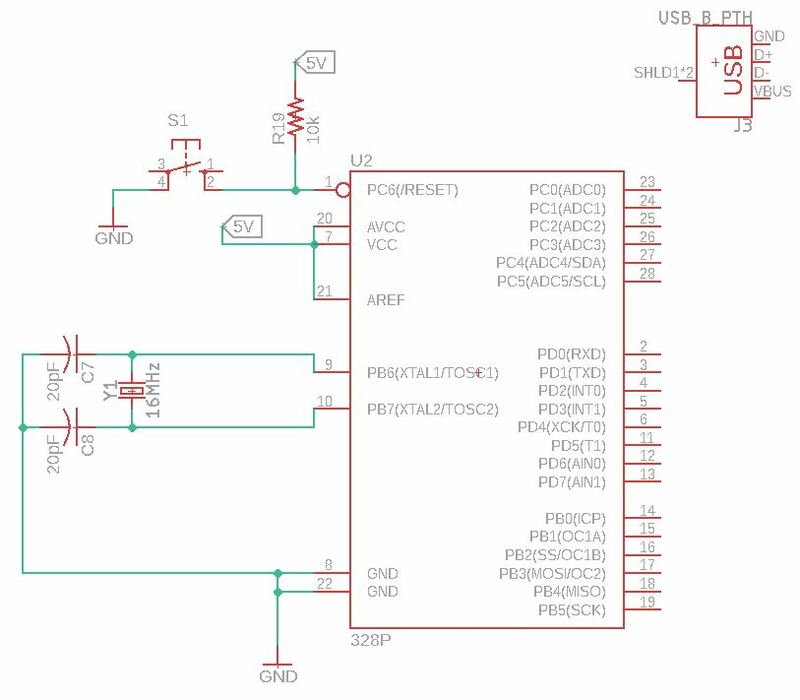 Since I want it all on one board like the arduino uno my question is how is the USB-B connected to the microcontroller and how would i Incorporate in my schematic? The USB interface forms a bridge between the USB connector and the UART of the "master" MCU. You don't have to use a microcontroller, but almost any UART to USB bridge chip will do the job. Common ones are the CH340G (cheap and unstable), CP2102, FT232, etc. The DTR signal from the USB chip is used to reset the main MCU. You should look at the existing Uno schematics to see how the two chips are wired together. You would program the board through the ICSP pins - in the same way that you put the bootloader on. Normally you'd invest in a proper programmer to connect up to the chip, but you can do it with an Arduino acting as the programmer. Not the answer you're looking for? Browse other questions tagged programming usb atmega328 or ask your own question. How to read AC Voltage in arduino uno with 12V adaptor and usb cable.? How to make an Arduino USB programming circuit? Can the Arduino interface with USB devices without the USB host shield? What is a cheap way to interface a USB keyboard to an Arduino Uno? How to upload program to custom arduino board without USB FTDI and making it read only?